There is one word that describes the current state of the pickup truck market: volume. Looking at 2016’s sales numbers, it is clear that the pickup truck has been the big revenue stream for at least three manufacturers in the U.S. Ford, General Motors, and Fiat Chrysler Automobiles enjoyed a bountiful 2016 for their pickup truck offerings. Ford’s F-Series enjoyed their 40th year of sales leadership among all industry products. GM had a decent year with their Chevrolet Silverado and GMC Sierra, while FCA’s RAM Truck brand had a strong jump in their full-sized pickup truck offerings. This leaves Toyota and Nissan. Though their volume is not up with the “domestic three,” Toyota had a steady 2016 for their Tundra pickups. Meanwhile, Nissan has lifted themselves out of the doldrums. The Titan and Titan XD offerings are on an upward trajectory, thanks to the introduction of the half-ton model, the gasoline-fueled V8 and additional cab choices for the “heavy half” XD and half-ton. 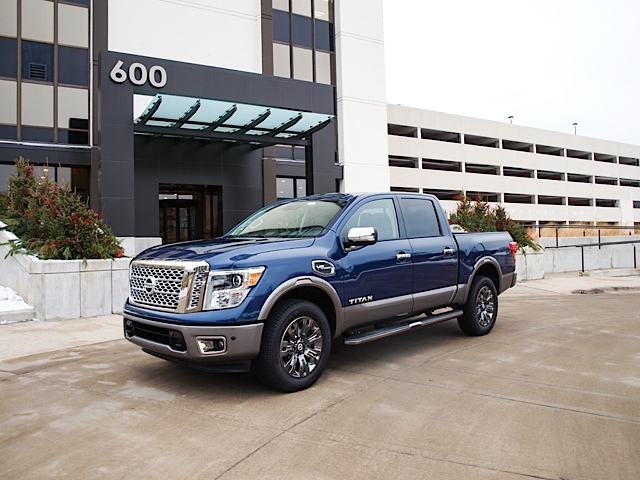 This turnaround has helped Nissan validate its Titan lineup. By introducing a diesel-fueled “heavy half” XD first, one wondered whether it would be worthy of competing against Ford, GM, FCA, and Toyota in the big truck arena. It is widely understood that a huge percentage of pickup truck sales are of half-ton models, such as the F-150, Silverado 1500, Sierra 1500, RAM 1500, and Tundra. For 2017, this problem was resolved for Nissan. The new half-ton Titan has helped jump-start sales and conversations among truck customers. This includes GLBT truck owners, in particular those of us who use them for work as well as play. In fact, the half-ton Titan already won Truck Trend‘s Pickup of The Year. This could be the first of several awards expected to be presented to Nissan’s big truck. For those reasons, we were ecstatic to receive a 2017 Nissan Titan half-ton four-wheel-drive model with the luxurious Platinum Reserve trim in the crew cab configuration. We were very curious whether the Nissan stacks well with everyone else in this most important and high-volume segment. One look at the Titan and one could come away with the impression that it does look the part. It arrives with a massive grille. In the Platinum Reserve, it is all chrome. Some might say that it may have come from another pickup, but a closer examination would tell you otherwise. The profile is a giveaway to the Titan’s uniqueness. Chromed details, such as the side “grille” and specific chrome grille and trim for the Platinum Reserve also create uniqueness compared to the competition. However, there is a bit of a “kink” bridging the engine bay area and the cab itself that signifies the Titan above all. Once you find what makes this Nissan stand out above the rest, then you are assured you are getting a solid pickup. As with most standard crew cab configurations, the bed measures out to 67 inches inside. It is the only bed configuration for half-ton Titan crew cab models. Single cab models get only a 98.5-inch bed. With four-wheel drive, the Titan stands 10.1 inches above the ground for superb clearance on tougher, uneven surfaces. As a trend in crew cab pickups, the passenger space is large. Front seats are big with plenty of comfort available in the Platinum Reserve trim. Rear seat room is good with a comfortable bench with split rear seat backs for access to a small storage space. In the Platinum Reserve, the rear seats are heated. A wide center console offers both covered and uncovered storage that is deep for larger items to be fitted. Luxury is the key to enjoying the Platinum Reserve, with its two-tone black and brown leather motif. The driver enjoys huge dials with a comprehensive TFT information screen in the middle. This is the opposite of every truck out in the market, and a very shrewd move by Nissan to emphasize basic information rather than flood the truck with a huge screen in-between the speedometer and tachometer. NissanConnect is controlled by a touch screen in the upper middle of the center stack, within reach of the driver. The screen also houses the output for the Round View Monitor. Every control and switch corresponds to Nissan’s standard switchgear. Shifting is done by a huge column-mounted lever, which helps in freeing up console space for storage. Rockford Fosgate supplied the sound, while there is Bluetooth, USB, and aux cable connectivity to the infotainment system, including a navigation system. The short bed came with a lot of amenities for load organization and control. The side walls of the bed have channel tracks with LED lights underneath them. The cargo lights on the back of the cab also help to illuminate the bed at night when a load is needed. There are also skid plates on the bed liner, as well as other organization options for proper use of the rear cargo hold. The Titan is designed to make things easier for loading and off-loading of construction materials, tools, and everything you need for landscaping to having fun year round. 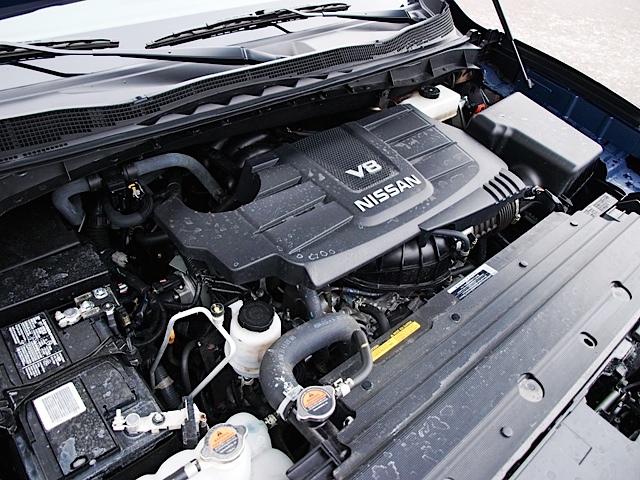 To haul in the Titan, Nissan decided it needed an engine to match its capabilities. All half-ton Titans come with a 5.6-liter V8, similar to the one on the previous generation model. However, this V8 was upgraded for more performance, jumping the horsepower to 390, with 394 pound-feet of torque. 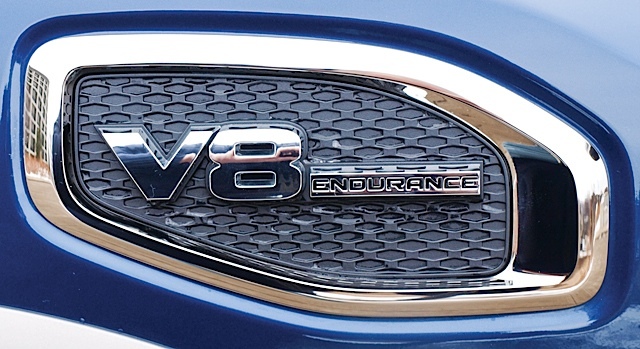 Named the “Endurance V8,” the improved engine delivers strong power and good acceleration throughout the power band. A six-speed automatic transmission connects the Endurance V8 to its four-wheel drive system, easily switchable by a knob on the center stack. 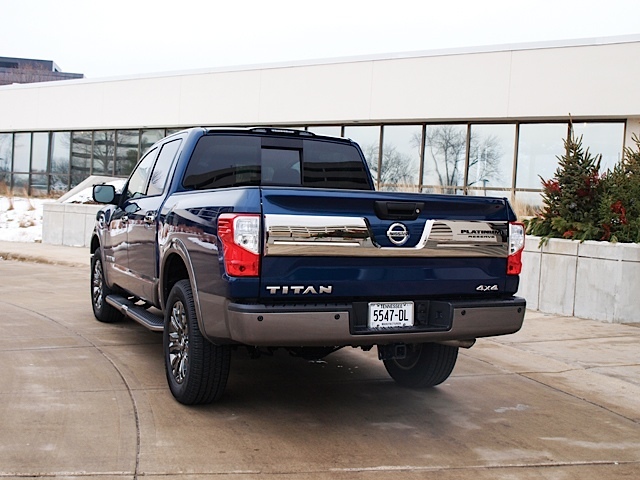 Titan Crew Cabs are capable of carrying 1,610 pounds of payload in the bed, with a maximum towing capacity of 9,390 pounds. As for fuel economy, we observed an average of 14.1 MPG. In driving the Titan, you will find a smooth ride that is absorbent on rougher surfaces. This truck has double wishbones up front and multi-leaf setup in the rear. Expect some lean and roll through the corners, but a more careful approach will keep the Titan even through some of the more twisty roads. Steering feel is tight and direct. For the half-ton, the turning radius is a bit wide, but controlled to make even U-turns easy. In tight spots, the Titan will need to take a few turns to get itself on track. Brakes are very solid with good stopping power. Normal, panic, and winter stops are controlled with the ABS kicking in at the right time. Aside from the Round View Monitor, Nissan added Blind Spot Warning and Rear Cross-Traffic Alert, sonar sensing for front and back. Currently, pricing for the Titan starts at $29,580 for a single cab, rear-wheel drive S level trim model. On the opposite side of the half-ton spectrum, our Platinum Reserve crew cab four-wheel drive model came with a sticker price of $56,595. One consumer item to note: the Titan is covered by a five-year/100,000-mile basic warranty, which Nissan touts as the longest coverage among full-sized pickups. There are plenty of conclusions to make about the Titan. For one, Nissan finally cracked the code on how to make a full-sized half-ton pickup truck to meet with competition. Still, there are arguments against the half-ton Titan, with all four competitors capable of higher towing and payload capacities, along with achieving better real world fuel economy. Those are the key points of comparison Nissan needs to meet or exceed with their half-ton models. Even though the Titan XD is available for greater towing and payload needs, most pickup truck buyers will go with the half-ton models; not just for the price point, but the fact that not every truck owner actually tows 10,000 pounds on any given trailer or carry 1,500 pounds of stuff in the bed. For work, perhaps. For play, a truck owner knows that larger boats require at least a three-quarter-ton or one-ton pickup to do the job competently. With all of this aside, the Nissan Titan half-ton pickup truck is a solid contender. It is a livable truck that will do the job, from bringing home the new lawn or garden project to bringing up the ATVs to the cabin for the summer. Ummm 5 year 100k warranty…not 60k. Jeremy – we stand corrected. It is 5 Years/100,000 miles on the basic warranty of the Titan. We changed it in the web version, but the print. Again, our apologies.